Asus expands its K-Series to a 16.0 inch dipslay with the K61IC. The ice-cool technology is once again on board and provides for comfortable temperatures around the palm rest. But this isn't the only surprise. The maker also amps up the graphic card to a Nvidia GeForce GT 220M. Does this perhaps turn the once lame office notebook into a true racer? Asus K61IC-JX019V - Can the new member of the K-series stay "ice-cool" - despite dedicated graphics card? 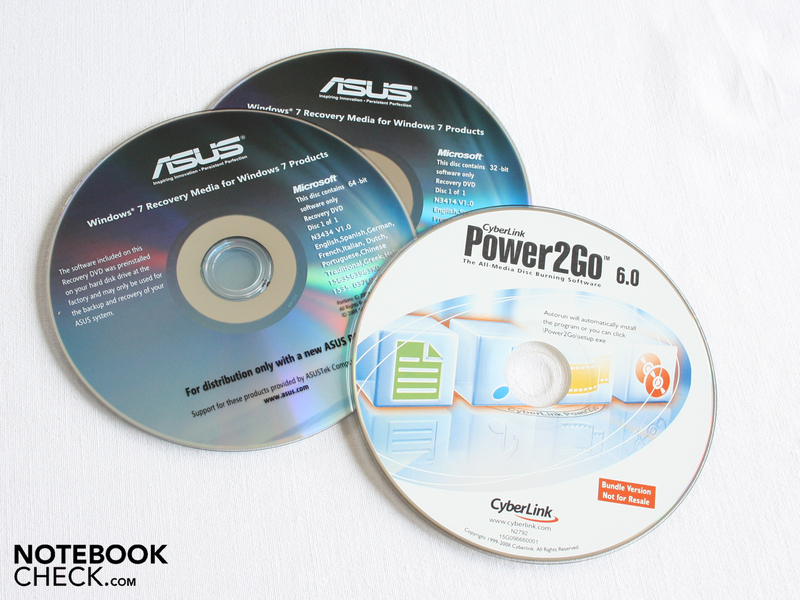 In the summer of 2009 Asus advertised its then young K-Series as an upscale all-rounder platform in the theater-friendly 16:9 format. Up to now the K51 laptops have fallen short of this claim: Instead of a mainstream graphic card there was only an ATI Radeon HD 3200 integrated in the chip set. Instead of a powerful processor there were only inefficient AMD-Athlon CPUs. The same 15.6 inch bare-bone popped up here and there under the guise of X5DIJ, which was equipped with a somewhat faster Intel Pentium Dual Core T4200. But the weak link was the graphic card, and it remained identical with the X5DIJ, still being based on a GMA 4500MHD. A big flaw was the missing HDMI connection. But the predecessor of our K61IC tester could prove one thing: No matter under which name and in which configuration, the temperature and the noise emission were surprisingly positive. 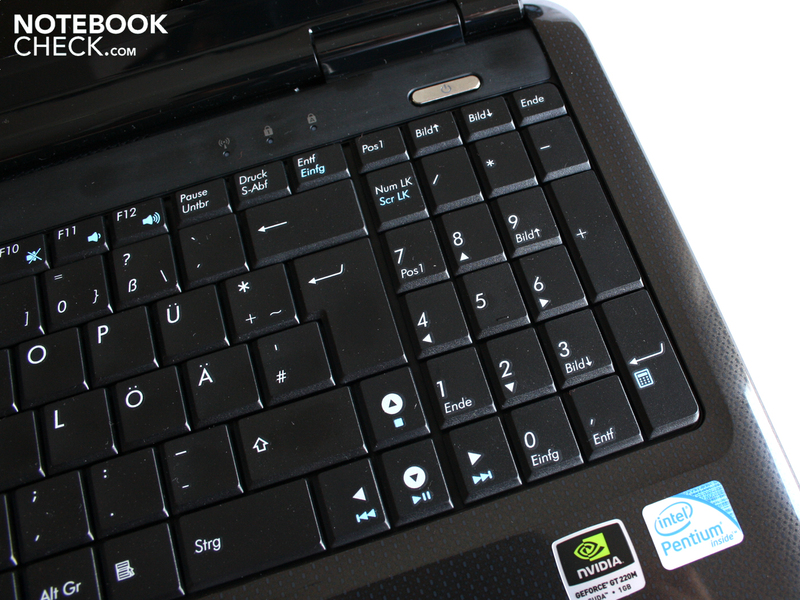 The Asus K611C-JX019V before us sports the same Ice-Cool sticker. Does it still remain quiet and cool with the dedicated graphic card? The Asus K61IC has a decently rounded look. The extremely wide 16 inch display catches ones eye right away. The long extended case allows the maker to easily integrate a complete numeric pad. The palm rest seems very weight, something that should please serious writers. Anyone looking for optical refinement will however be disappointed. 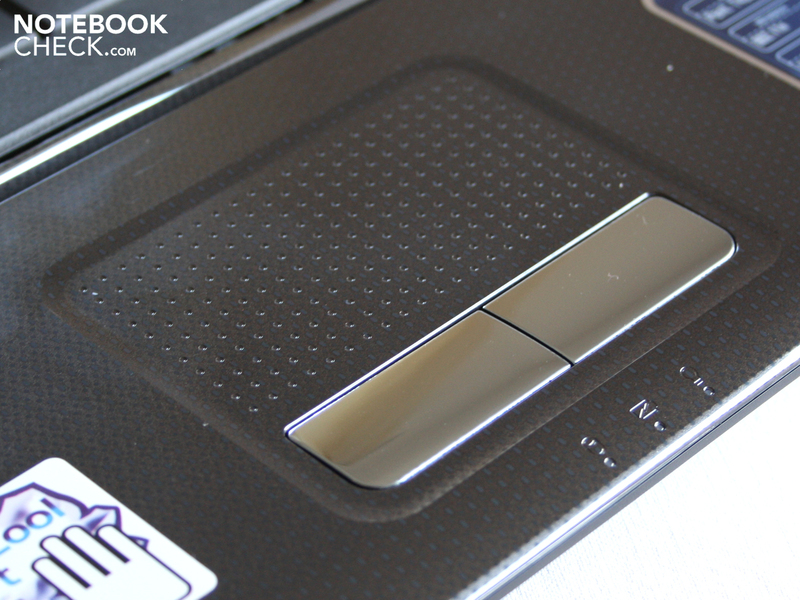 Aside from the shiny silver touchpad keys, the case has little to offer. Worth mentioning is at best the matt black aluminum moulding over the keyboard. The imprint finish on the cover and the palm rest make a point-to-point pattern. The observer will only see this when up close. The user can tell by hand how stiff the chassis is. We were able to flex the case with both hands, but only a bit. The underside and the sides are made out of coarse plastic. 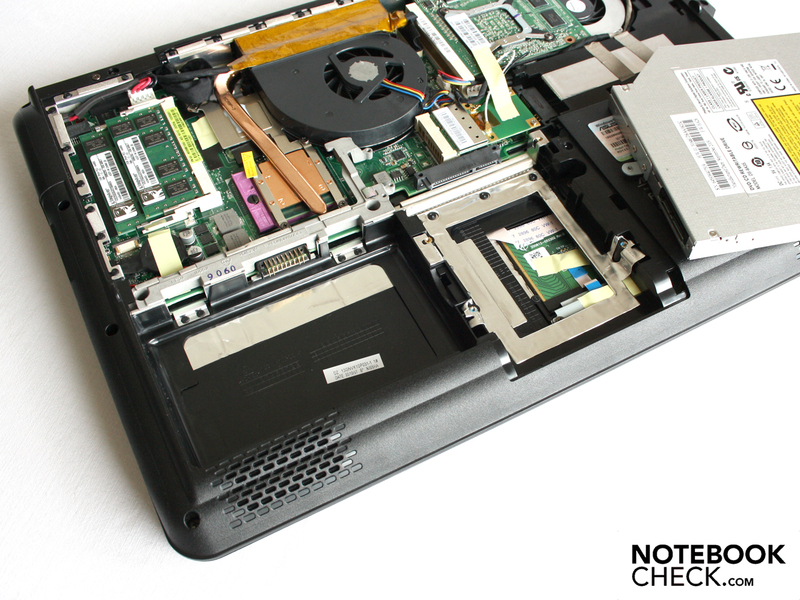 Whereas the ports on the sides are embedded, the base panel allowed us to see into the inner workings of the notebook. After loosening a few screws we could remove the plate giving access to the entire hardware. More on that in the picture montage. 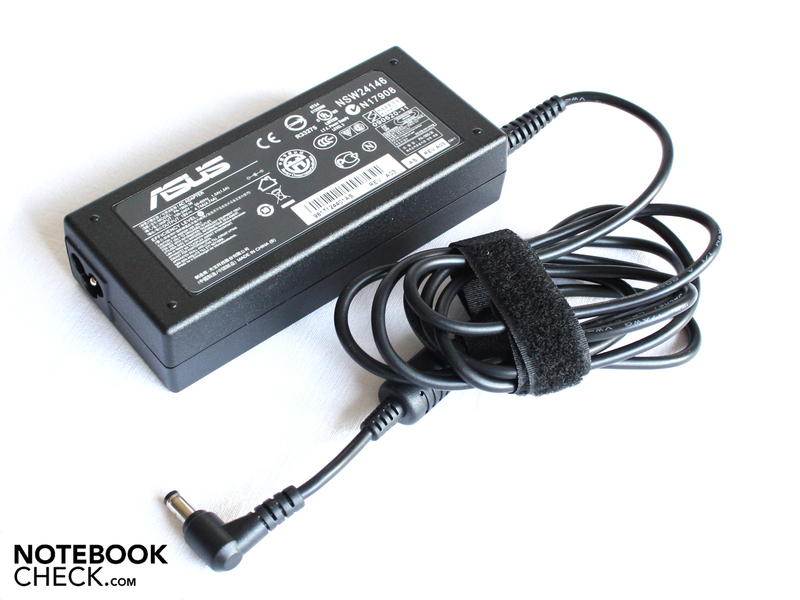 The Asus K61IC comes with only a limited number of connections for hooking up external devices. E-SATA, Bluetooth, a display port and Firewire are all luxury items which a K61IC can't support. Still, there is a HDMI port on the backside next to the fan outlets. The previous model X51DIJ brazenly passed on this virtually standard option. 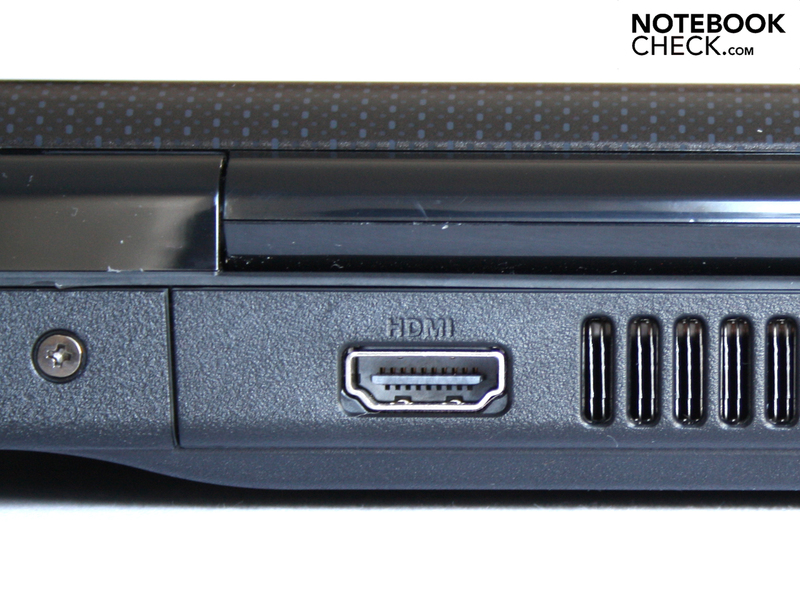 The extreme monitor or flat screen can however be connected over the analog VGA interface. There are four USB ports. These laterally aligned ports are positioned so closely to one another that wide USB sticks or snug connectors will get quite cramped. We think positioning them on the area furthest away from the palm rest was a good idea. 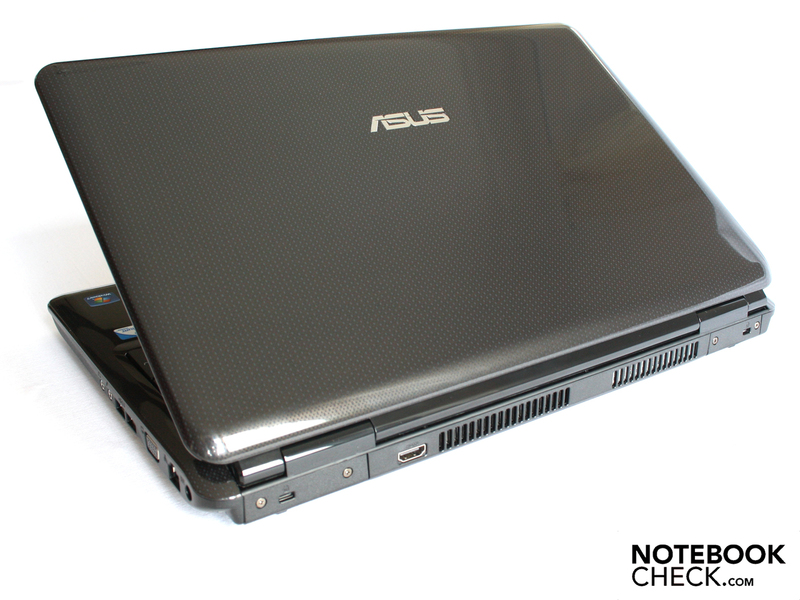 That way the user can quickly lift up his Asus notebook without disturbing the connected USB sticks. The keyboard is suitable for the casual typist. 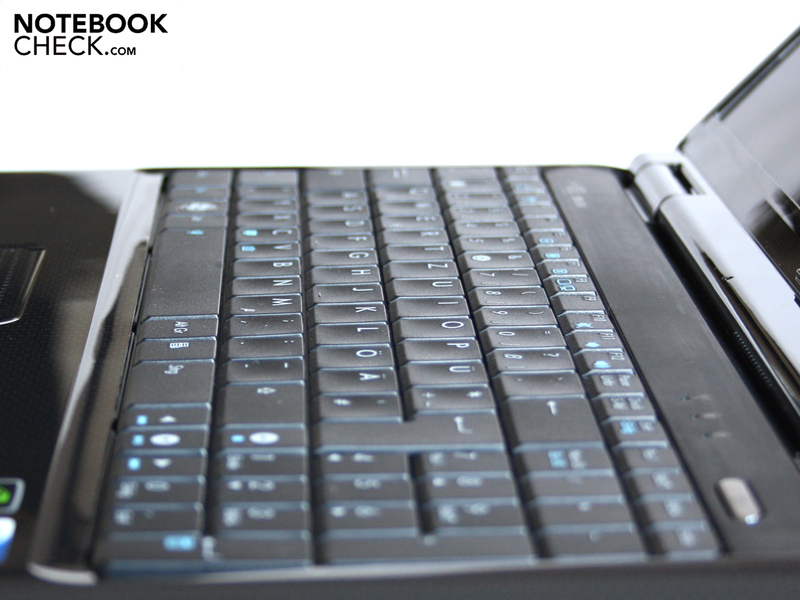 Those demanding high quality pressure points and a solid typing feel will not strike it rich with the Asus K61IC. 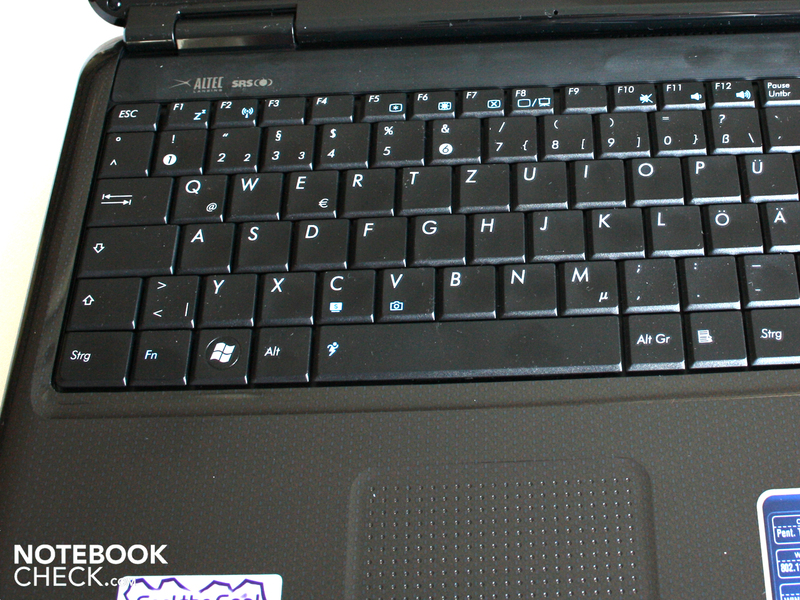 The keyboard sags noticeably and the keys allow a stroke that is too limited. The feedback when writing is thus too vague and certainly not satisfactory for many writers. Still, we find a completely integrated numeric pad. This helps those workers using Excel when entering number columns or simply when using it as a calculator. We were able to get used to the touchpad after some time. The smooth surface initially gives washed-out feedback when moving ones fingers. The small recesses nonetheless help to deliver a fair amount of grip. What we don't like are the painted keys of the pad. These are a collecting point for fingerprints and smudges of all kinds. The panache-touchpad doesn't offer a real multi-touch feature. Though the user can roll vertically or horizontally with two fingers, the touchpad doesn't allow for zooming or rotating. Users can adjust the sensitivity of the hand sensor in order to minimize unwanted mouse movements with the heel of hand. 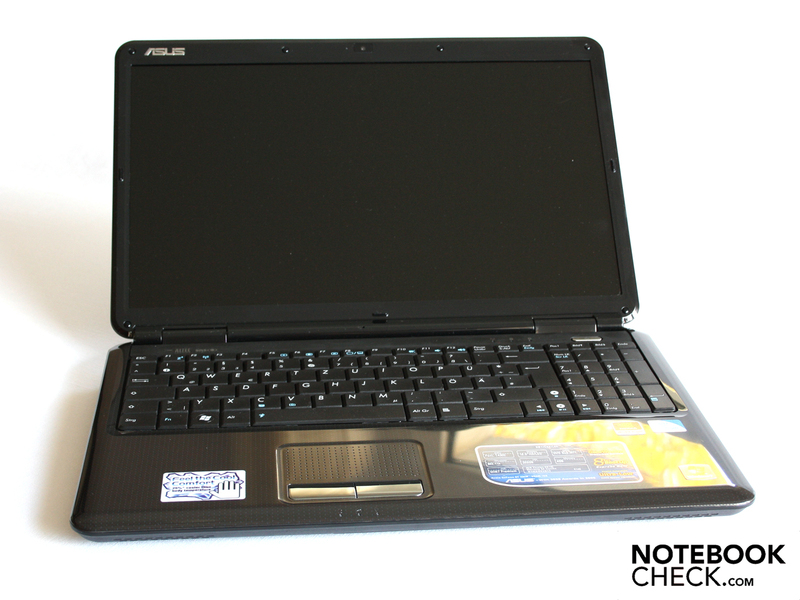 The Asus K61IC doesn't set a high standard with its input devices. The display doesn't change that either. The non-AR coated Hannstar-Panel HSD160PHW1 has a 1366x768 pixel resolution typical to this price class. This WXGA-resolution is already very rough, but not bad per se. There are many users of office notebooks to whom normally large symbols and writing prove advantageous. The transition from 15.6 to 16 inch has no affect on the user. 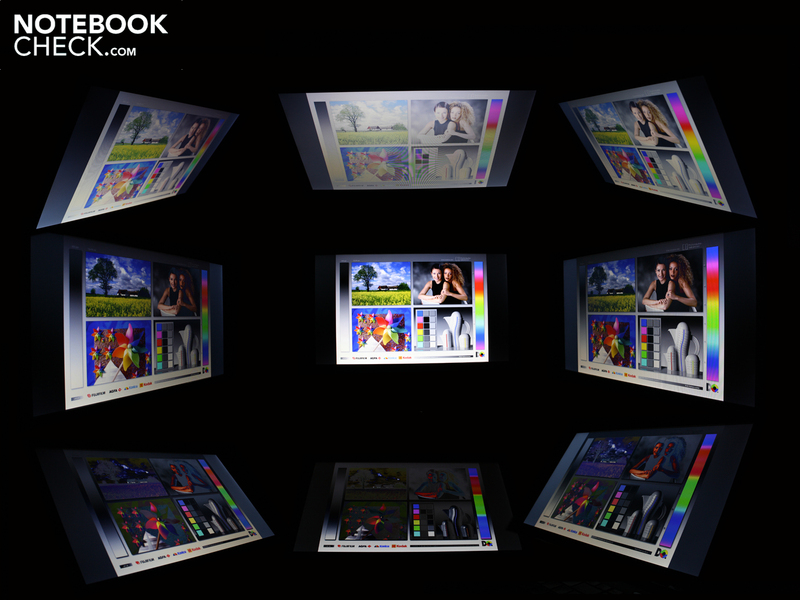 The 1366x768 pixels come very close to the 16:9 aspect ratio. Wide displays are in theory meant to allow two program windows to be shown next to each other. Practically speaking however, the limited resolution does not allow this unless the user is ready to accept a noticeable resizing. Resizing means an increase or decrease of the shown content. This is possible in a progressive way in all web browsers or also in Microsoft Office. The Hannstar-panel has its own flaw in terms of the limited contrast of 204:1. This value is typical for office notebooks and is also acceptable in the price class around 600 Euro. Buyers with high demands on color fastness, or more simply put, crisp colors, should look for an alternative. The glare-type panel does however visually improve the limited contrasts, but that is nonetheless a mere trick of the eye. Tests of the brightness of the display screen gave acceptable, but in no way good results. On average the illumination was at 200 cd/m². This illumination is not consistent, however, as the Hannstar-TFT reaches 220 cd/m² at its brightest point and 188 cd/m² at its dimmest. On a black screen, for instance when uploading Windows 7, we clearly notice a thin bright strip on the lower edge of the display. The glare panel during outdoor duties. 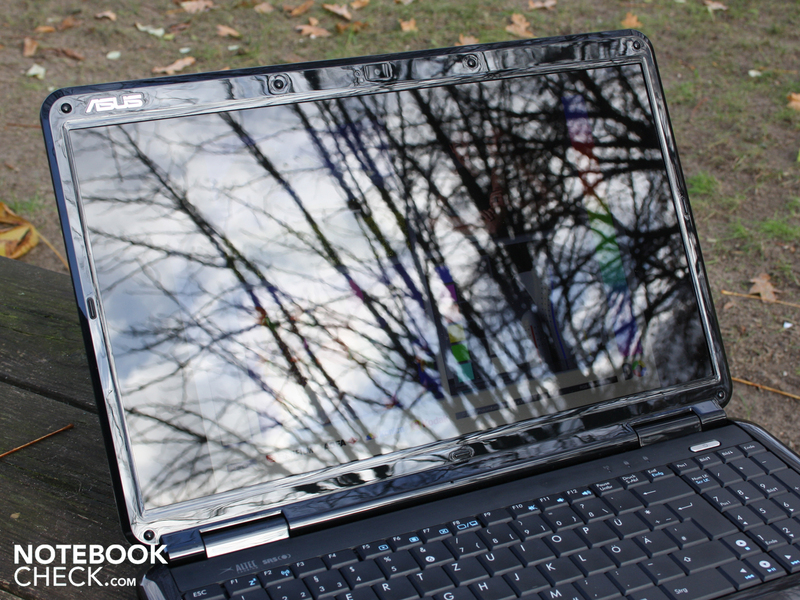 Those who like to go out in the sunshine with their laptop are out of luck with Asus K61IC. The 16 inch panel is missing a lamination which could minimize reflections. 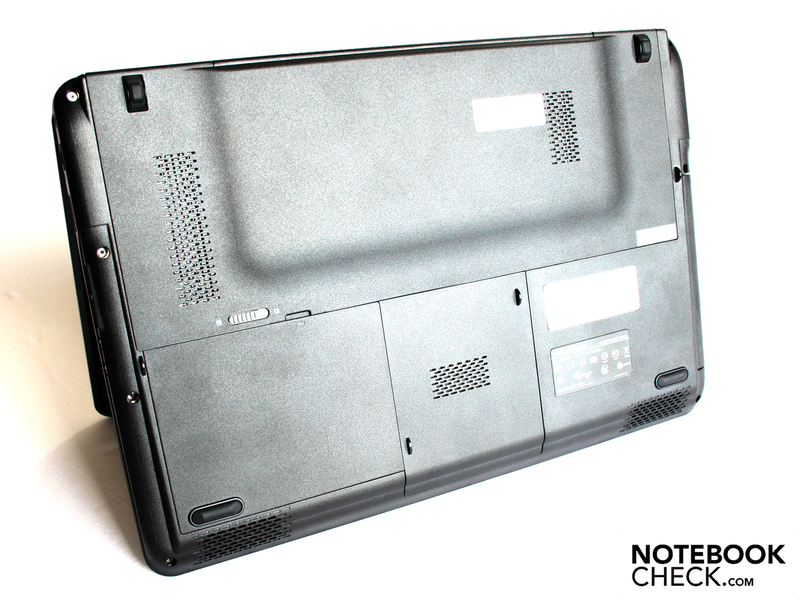 The modest brightness means that users in sunlight have to bend and turn the laptop in order to read anything on a shadowed spot of the display. The scenario for K61IC users is less menacing indoors. The brightness is always sufficient, so much so that sensitive eyes will even want to dim it. Bright backgrounds, for instance a window or a desk lamp, are, however, a constant frustration. Viewers have the most leeway when moving horizontally from the ideal viewing angle. If one strays right or left, writing continues to be clearly visible up to 80 degrees and even the colors don't invert. It looks much worse vertically. Colors change at a mere 10 degrees, writing is no longer decipherable at 45 degree and the colors invert to an unrecognizable level. 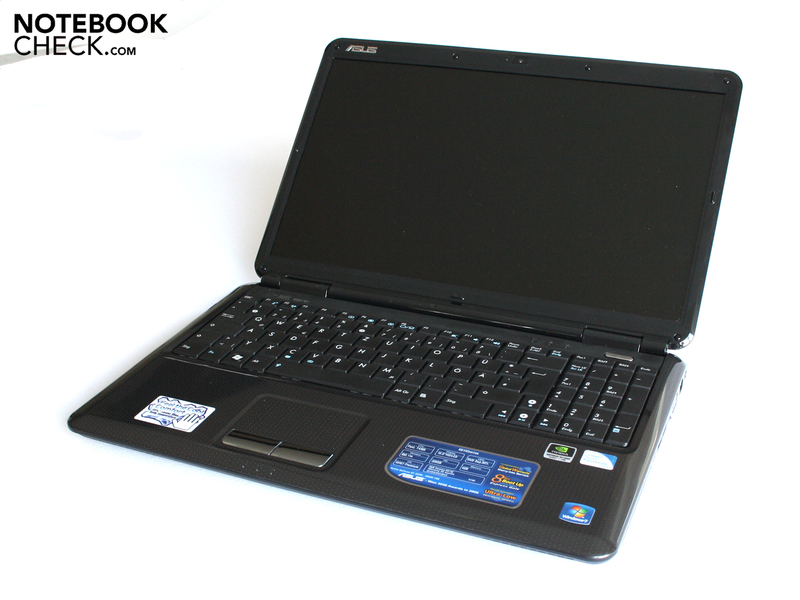 The Asus K61IC-JX019V is equipped with a weak, but reasonably priced Intel Pentium Deal Core Processor T4300 (2.1 GHz, 1 MB L2-Cache, 800 MHz FSB). 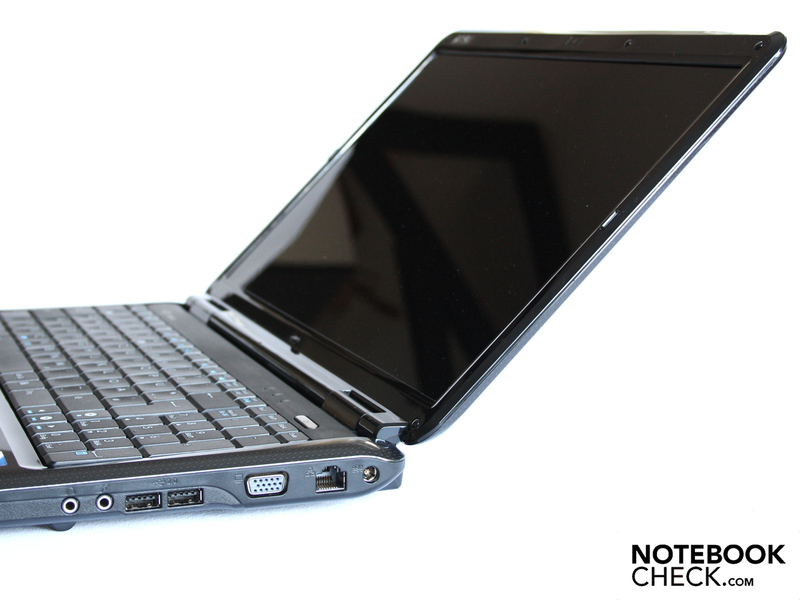 It is the big brother of the T4200 Pentium Processors (2.0 GHz) which we found on the HP Pavilion dv6-1211sg. Together with the Nvidia chipset MCP79/7A and 4 GB memory of the type DDR2 there are enough reserves for typical office tasks. The performance is made for watching movies, creating documents, editing pictures or surfing the Web. The Windows 7 Home Premium 64bit already installed is always in command of the 2.1 GHz processor. An NvidiaGeForce GT 220M serves graphic card duties. 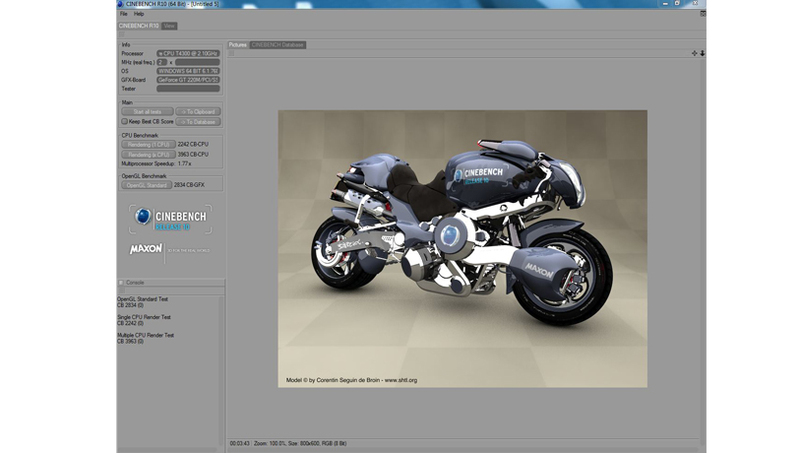 The beginner GPU is equipped with GDDR2 video memory which fits with its claims of being an all-rounder graphic devise. 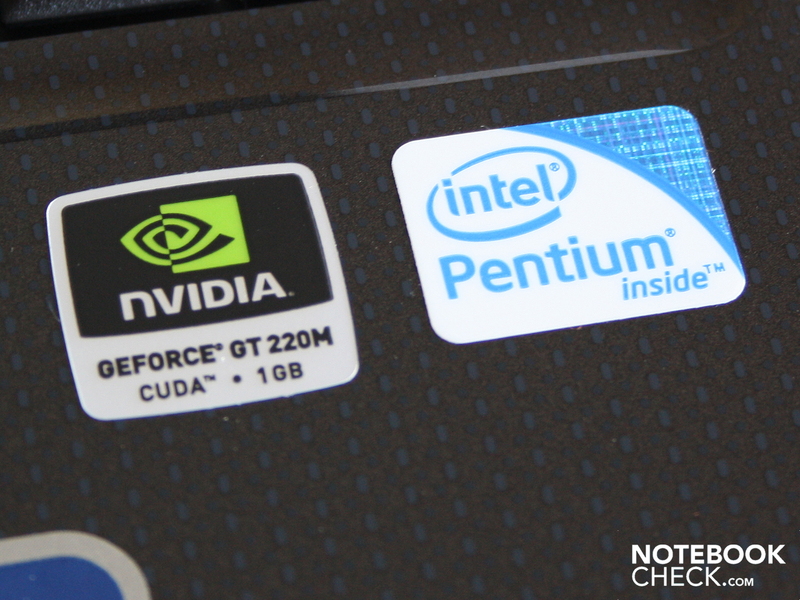 According to Nvidia its sister model, the GT 230M, already belongs in the performance class, which is also demonstrated by the GDDR3 memory used there. Interested buyers of the K61IC will likely also come across the ASUS K61IC-TY014V while doing their research on the project. Even if it isn't at first clear from the name, that is a 17 incher with Core 2 Duo T9600 , GeForce GT 240M and 2 x 500 GB hard drive. The 17 inch counterpart costs a lofty 1,150 Euro, however. The latencies on Windows are interesting. If too high, they can lead to problems connecting external devices (for instance sound crackling on external sound cards or short interruptions in Real Time audio). The K61IC does not perform all that commendably in this area: According to the Tools DPC Latency Checker, the latencies stay in the not-exactly harmless range under 500µs. The causes of this are normally faulty drivers of internal devices like WLAN adapters, sound cards, USB host controller, etc. 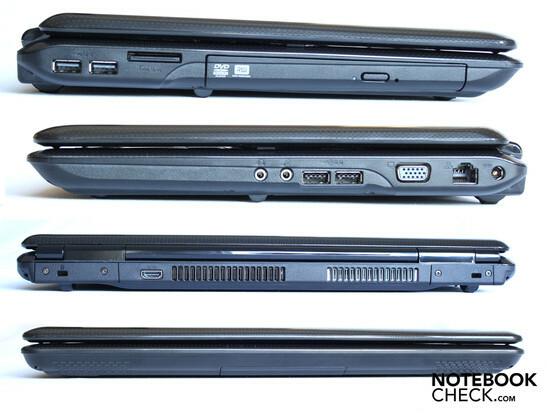 Anyone buying a notebook wants enough performance to run the advised applications for the next three years. With the Pentium Dual Core Processor T4300, buyers can bet on a sufficiently fast processor for the Windows 7 operating system. Windows Vista would also be no problem for the two-core CPU. The PC Mark Vantage determines a system performance rating of 3,175 points. In this test, all components from the processor to the internal memory and the hard drive are tested and undergo a synthetic application test. 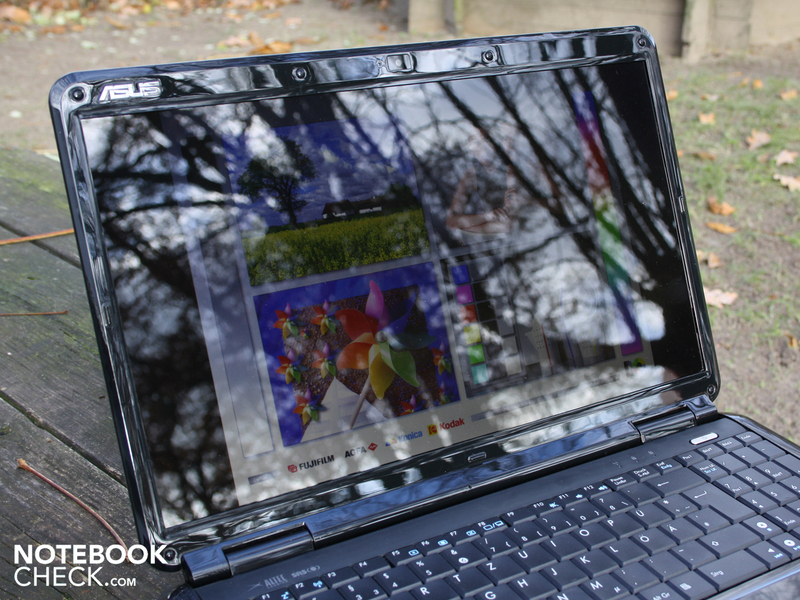 The PCMark-Vantage-Graphic shows clearly: The ASUS K61IC is, and remains a beginner notebook. Systems with faster hard drives and more modern Intel Core i7 processors are miles ahead of it in application performance. Anyone looking for a long period of peaceful hardware operation performance should go for a faster Intel Core 2 Duo (e.g., P8700) instead. Thanks to the influx of the Intel Core i7 four-core CPUs on the market, the previous generation of Core 2 Duos will be more affordable in the future. The Hitachi hard drive (HTS543232L9A) with a gross capacity of 320 GByte does not deliver good date throughputs during sequential readings. 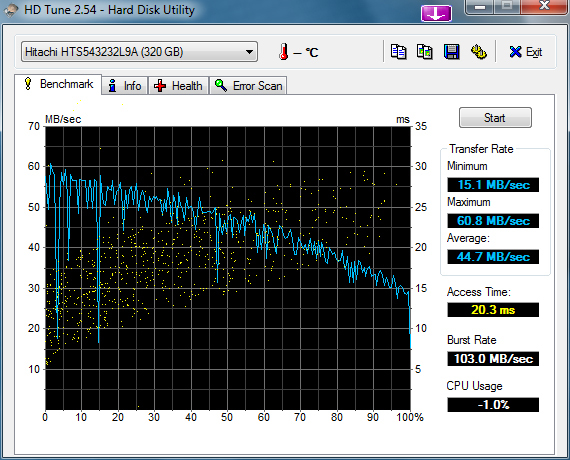 HD-Tune measures 44.7 MB/s, an under-average value, even for a 5.400 RPM notebook hard driver. The Nvidia Gefroce GT 220M is not a suitable graphic solution for real gamers. Though the same graphic chip found in the significantly higher-performing GT 240M is used, the results of the 3D Benchmarks are appreciably worse due to a lower timing. 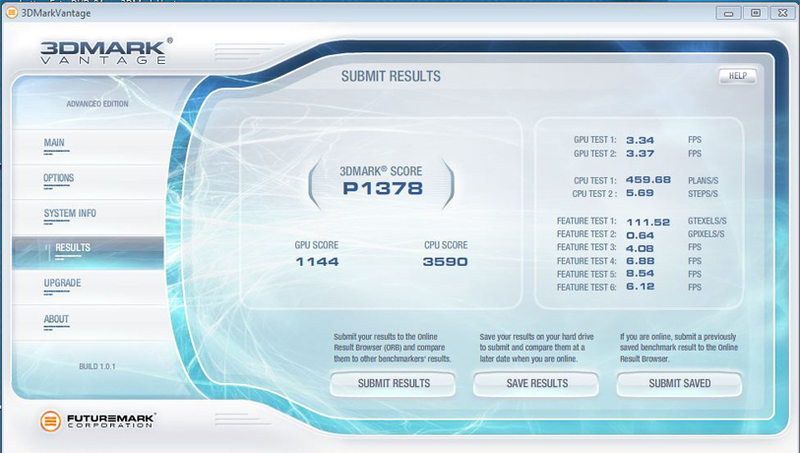 After repeated runs, the 3DMark06 resulted in a mere 4.010 points. 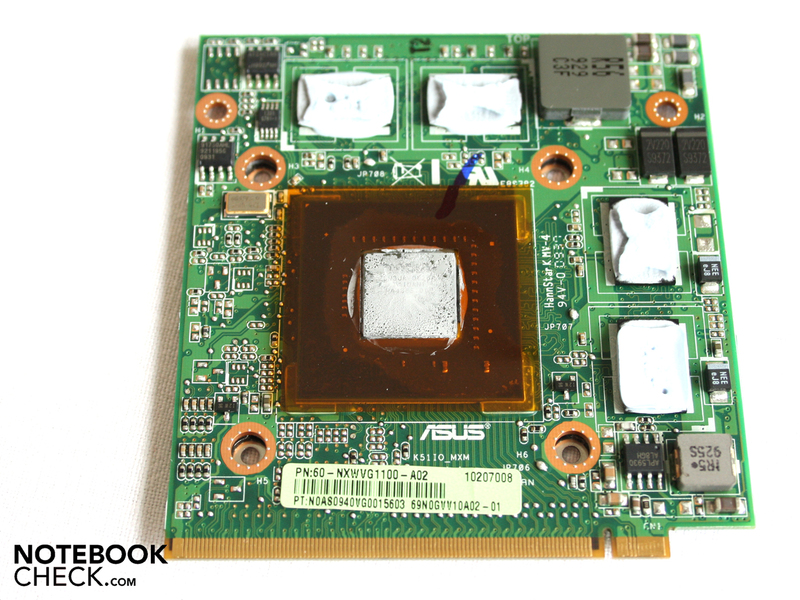 The GT 220M-GPU is not fundamentally so slow, but Asus clocks the GPU, plugged by them as an MXM-Module, much lower. 500, 400, 1.250 Mhz, those are the clock rates of the core, memory and shader respectively. In other notebooks in the field, like the Asus X64VG, the same GT-220M-GPU runs with 550, 500, 1.350 MHz (core, memory, and shader), which makes it possible to get around 5.300 3DMarks06 points with the same processor. 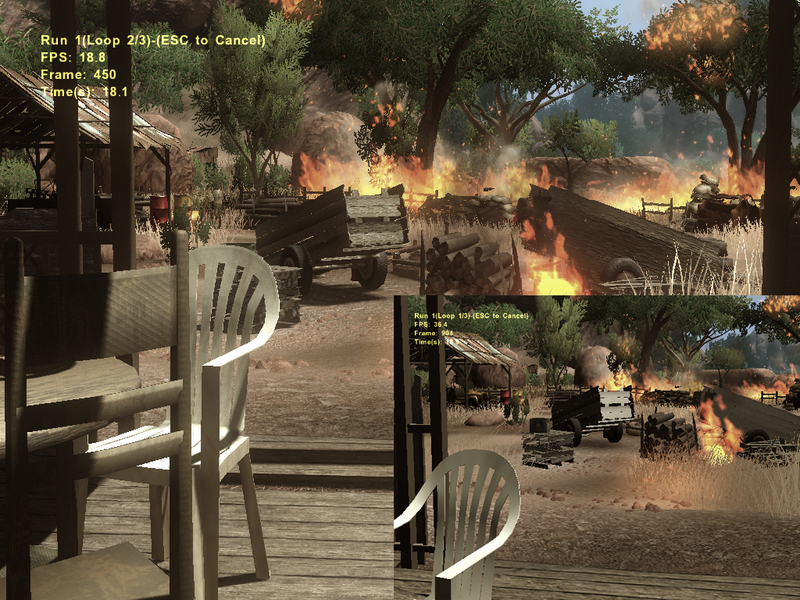 We tried out FarCry 2 and got very modest results: 23 FPS in the higher detail level but lower 1024 x 768 resolution. Those who want to play games every now and then and are also considering more recent games should look for an alternative with at least a Nvidia GT 240M or ATI Radeon Mobility HD4650. Notebooks with these GPUs can already be had for prices starting at 600 Euro. While the predecessor to the K61IC surprised with a noticeably cool palm rest area and minimal noise, the K61IC fell short of expectations. 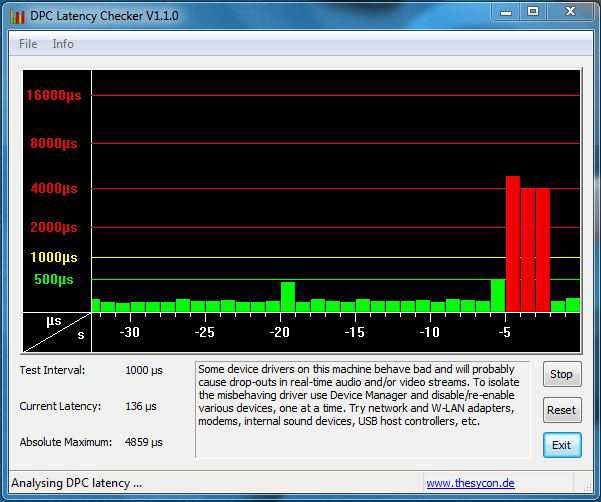 Under heavy load from the graphic card and processor during our Stress-Test, the Asus laptop got as loud as 44.5 dB(A). Such a heavy load wouldn't be reached in a typical user scenario and 37.6 dB(A) is thus a more appropriate point for orientation. It would have been to the advantage of many office users if the 16 incher would stay quiet during surfing or working in Excel. This is unfortunately not the case; The fans always make their presence known with at least 32.5 dB(A). This whooshing is created by two separate fans, which each move the warm air from the Pentium processors and the Nvidia graphic card out of the case. The whooshing of both fans is constant and not irritating. 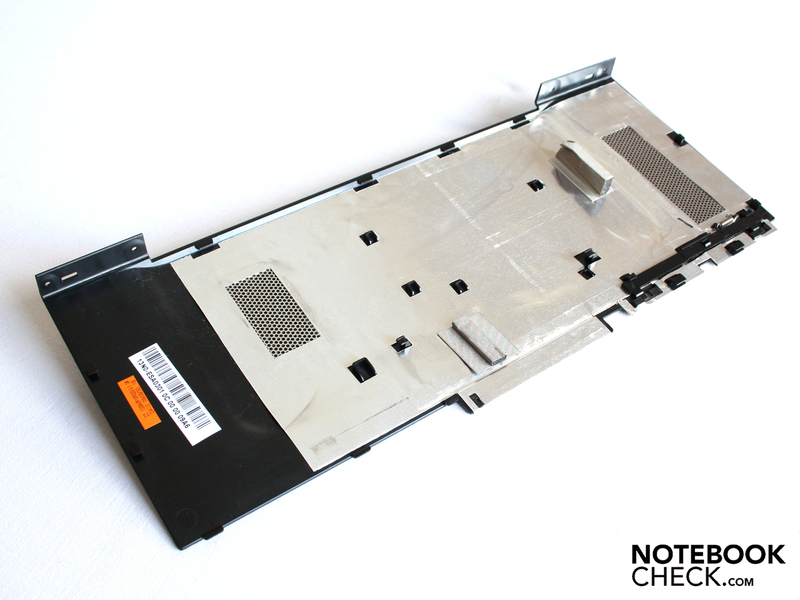 It is remarkable, however, that a generally weak-performing notebook like the K61IC is equipped with two heat pipes and two separate fans. The previous models each had only one fan. 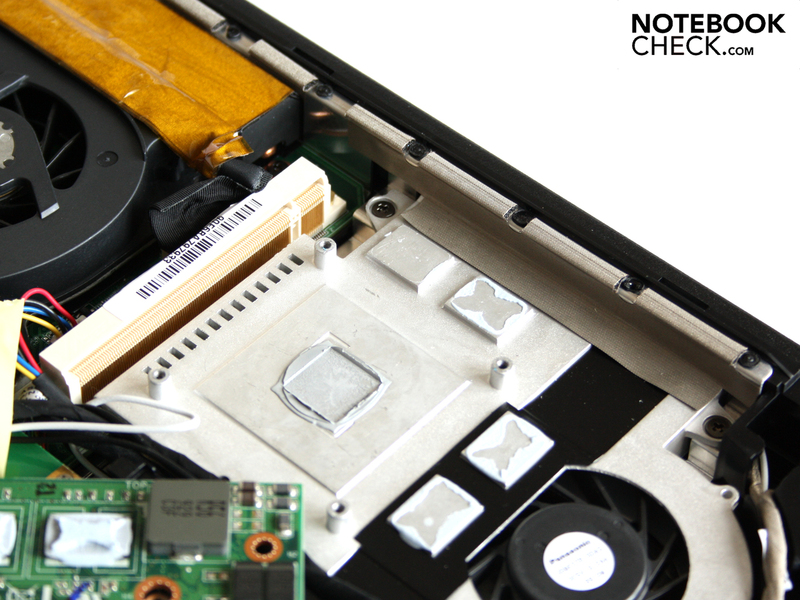 In terms of temperature, the two fans keep the surface cool without any trouble. The Ice-Cool sticker on the left hand rest points in the right direction. Even under stress we measured an average of only 25 degrees Celsius there. That is only three degrees higher than the room temperature during the test. It is remarkable how stable the temperatures stay on the top side of the K61IC, regardless of whether the laptop remains at idle or whether the GPU and CPU benchmarks are running simultaneously. The situation on the bottom panel deserves greater criticism in this respect, though only when the K61IC is burdened with an unrealistically high load. The highest measurements we got at the level of the heat pipes and air outlets was 45 degrees. Operating the laptop while rested on ones lap would be uncomfortable in such a situation. During a realistic scenario of surfing and word processing, the maximum temperature on the underside stays around 38.5 degrees. The areas around the palm rests stay comfortably cool at 26 to 30.7 degrees. The Asus K61IC doesn't allow itself to get worked up. We put the 16-incher under the stress of the Prime95 and Furmark for 12 hours. The processor did not heat up to more than 75 degrees Celsius and the graphic card was even much lower at 62 degrees. The low overclocking and the separate GPU coolers keep the temperatures low. 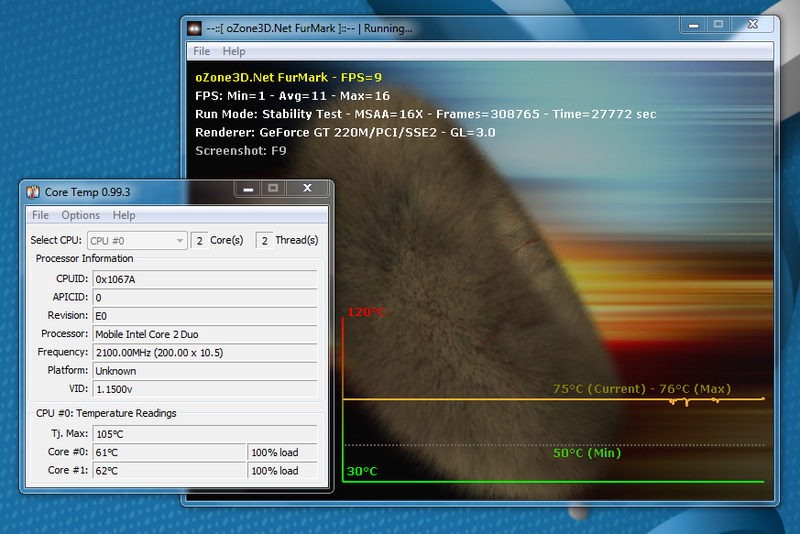 A 3DMark06 run directly after the Stress-Test resulted in 4.004 points. The Stress-Test seems to have had no affect on its performance (throttling). (+) The maximum temperature on the upper side is 33.9 °C / 93 F, compared to the average of 36.5 °C / 98 F, ranging from 21.1 to 71 °C for the class Multimedia. (+) The average temperature of the palmrest area of similar devices was 29.1 °C / 84.4 F (+3.2 °C / 5.8 F). Asus placed the two stereo speakers under the palm rests. They hit the tabletop with sound, something that doesn't lend itself to high expectations for the sound quality. In practice, the two speakers surprised us with a reasonable volume, which was high and undistorted. Though the Altec-Lansing loudspeakers lack subwoofers and thus have no bass, films, music and games get a suitably balanced sound thanks to the connectable SRS Premium Sound feature. Suitable means that we are dealing with a mid-toned sound. Balanced means that the diaphragms don't wear you out, even with a quick change from loud to quite tones, and that everything is reproduced in a differentiated way. That is especially impressive in action games or videos. 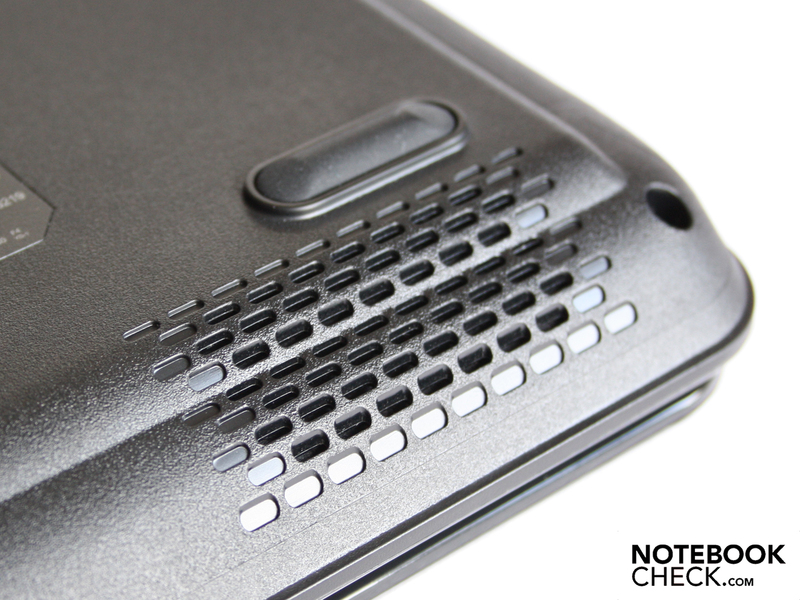 Many users hook up external speakers through the 3.5 mm sound outlet. We tested this with two active Yamaha speakers (YST-M20SDP). If desired, the level can be lowered on the notebook. Despite the onboard soundcard, even the limited input level does not result in rustling. The Asus K61IC doesn't win any prices for its mobility. 95 minutes of surfing with WLAN while watching a few Modern Warfare 2 clips on YouTube. That is not even two hours. Those who activate all the power-saving settings and only write Word-files will get away with 139 minutes. The Lithium-Ion battery with only 4.400 mAh has a capacity that is too limited to fairly support the power-hungry Intel Pentium processor. Though it is processed in 45 nanometer lithography, it has a very high TDP with 35 Watt. Those looking to watch a DVD film shouldn't pause it too often. After only 84 minutes our test was over; that's enough for one film, assuming it is of the short variety. In this age of ultra-low voltage processors with 10 to 15 watts of power consumption of a laptop, numbers like 43 Watt for normal office operation seem almost shocking. 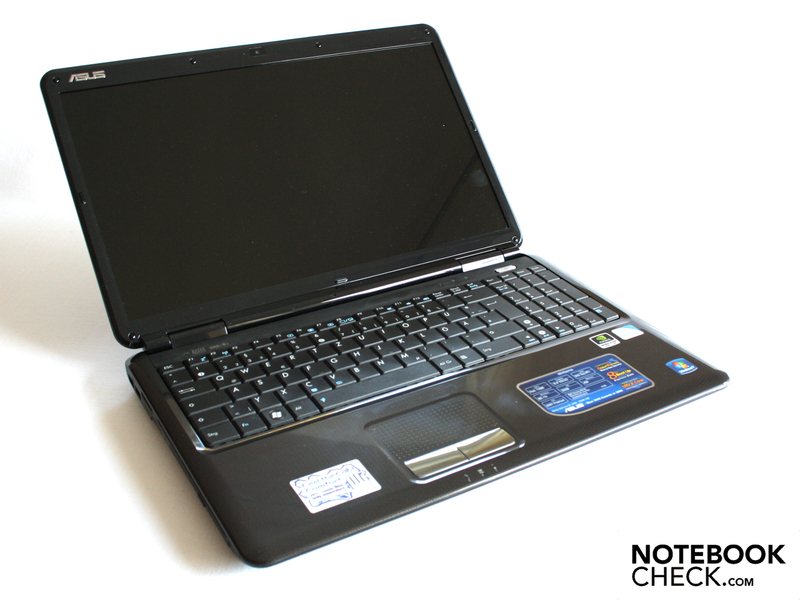 In fact, the Asus K61IC's hunger for energy is remarkable mainly due to the limited performance of the laptop. When we strain the notebook with a 3DMark06 and turn everything on including WLAN, the average true power climbs to 66 watts. That is simply too high, even with the dedicated Nvidia graphic chip. Asus dared to do an interesting experiment and equipped the K-Series with an OEM variant of the Nvidia Geforce GT 220M graphic card. Unfortunately, the low clocked GPU doesn't know where to start as it's too weak for recent and even older games. The GPU also has the disadvantage of having two fans in its case and the K61IC is incessantly audible. The battery life is in every way lousy. Whether 95 minutes of surfing with WLAN or 84 minutes watching a DVD, the mobility is too limited. The source of this shortcoming it the energy need of the components like the Pentium processor and also the Nvidia GT 220M. But even with a longer running-time the K61IC was not mobile: The fact that it weighs 2.8 Kilograms and has a display lacking anti-reflection coating, thus allowing for heavy reflections in the sunlight, go against it. The WXGA panel with its minimal contrasts go along with expectations for a laptop in the 600 Euro price class. There are few reasons to speak in favor of the K61IC-JX019V. 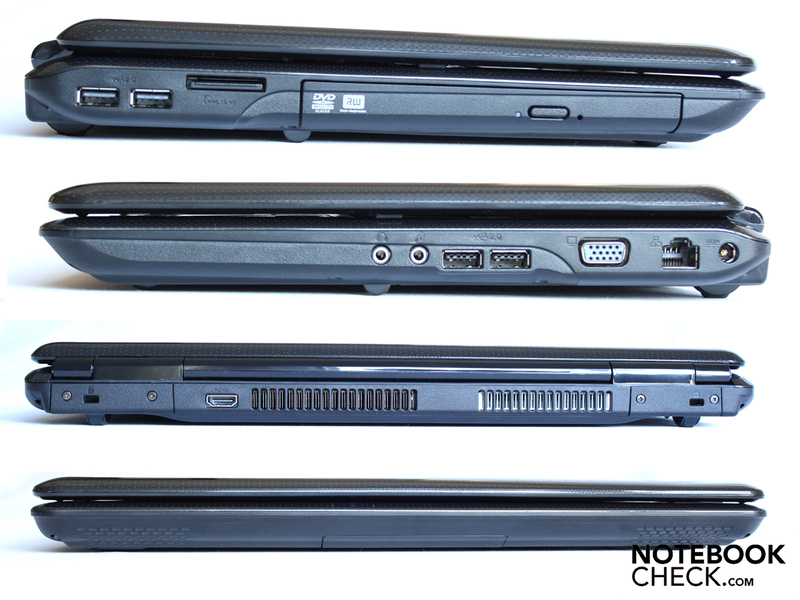 Those looking to Asus for a robust, quiet office notebook should choose the Asus X5DIJ, the K50IJ or the K51AC. All of these 15.6 inchers share the positive trait of having a cool case, but are quieter than the K61IC in this review. Buyers wishing a graphic card also aren't going to reach for the K61IC. The GPU resolution GT 220M from Nvidia is simply too weak to have fun with. This is especially true as the GPU is operated with such a low clock rate from Asus. 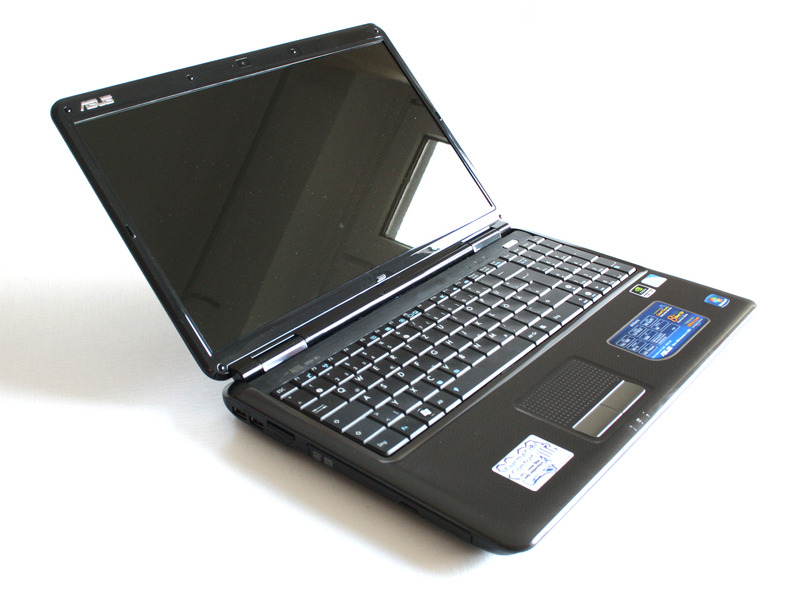 Moreover, there are already laptops with stronger GT 240M or HD4650 to be had from 580 to 680 Euros. 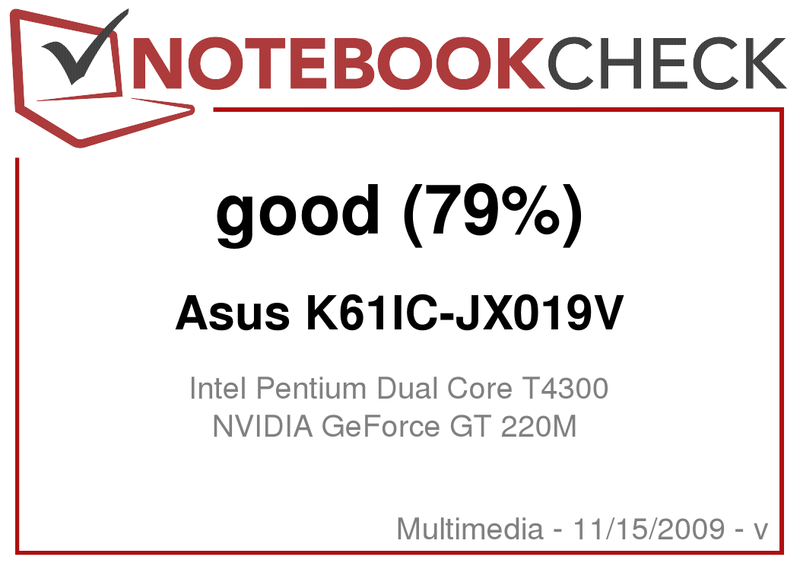 The Asus K61IC-JX019V with Nvidia Geforce GT 220M is not a suitable gaming-notebook. The 16 incher should still stay cool, however - even under load. The Ice-Cool technology consists of a double-fan cooling system. Here is the bottom panel. Removing the large panel exposes its whole insides. The processor has its own fan, as does the graphic card. 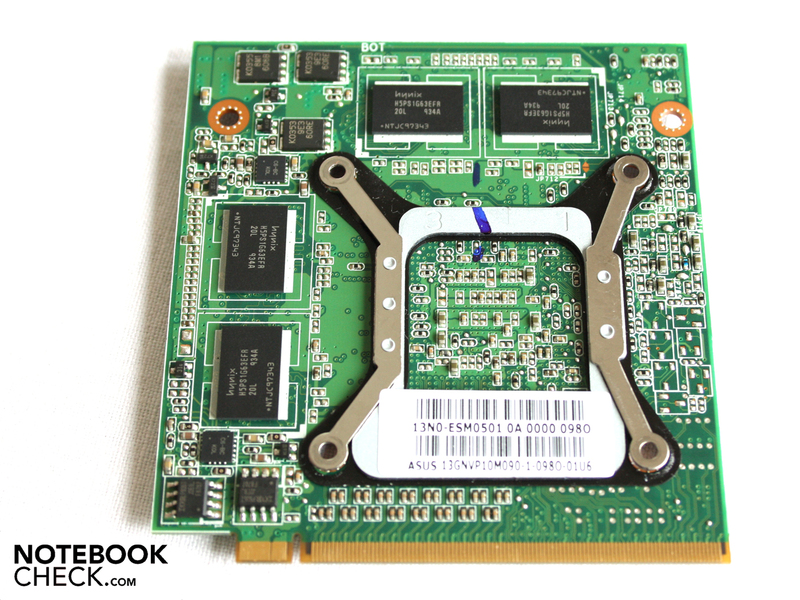 Asus plugs the Nvidia GT 220M as MXM-Module. The thick alu-cooling bodies could certainly cool stronger GPUs than just the weak GT 220M. Will Asus soon bring a version of the K61IC with the GT 240M up to the line? The palm rests stay cool, since under here are the battery, lubricated hard drive and the DVD drive. The included recovery storage medium from Windows 7 in 64 AND 32 Bit are praiseworthy. Asus equipps its K-Series with dedicated Nvidia graphics for the first time, the Geforce GT 220M. The HDMI connection wasn't on some previous models. ...that doesn't try to hide its size. The HannStar-Panel without anti-reflective coating is unusable in daylight. ... and the robustness of the case is easily seen. Unfortunately, the lid only opens to about 45 degrees. The high gloss finish makes the look, but there are also matt finished bits. The entire keyboard buckles easily under pressure. The two stereo speakers deliver a balanced sound. 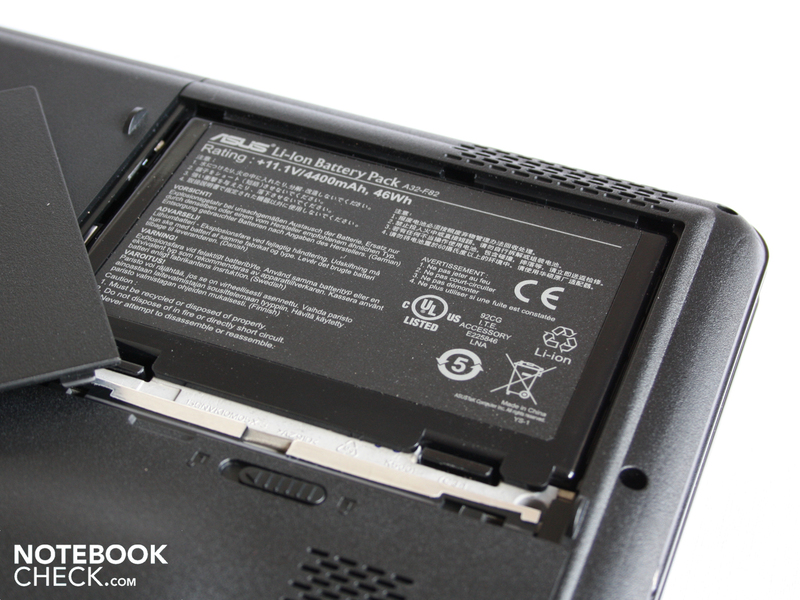 The battery with 4.400 mAH is found under a lid.. The 90 Watt power pack is not oversized. The K61IC needs a full 77 Watt under load. The stable case which appears without too many frills or additional buttons - finally with a HDMI connector. An outright commitment to being a mobile office notebook without a dedicated graphic card. The almost icy temperatures of the upper side, even with the dedicated graphics.